I decided to make hanging wall frames and the knobs as two separate posts. These are the frames that hang over our bed substituting a headboard. A cheap and simple solution that can decorate any plain walls in the house. Having worked as a custom framer for four years in college, I knew how to do the frames pretty easily. I knew exactly what to look for in a good sturdy frame as I searched the thrift stores. And don’t forget the tutorial on how to mount knobs on the wall for the complete look. paint primer or a sander if the frame has a seal on it. 1. 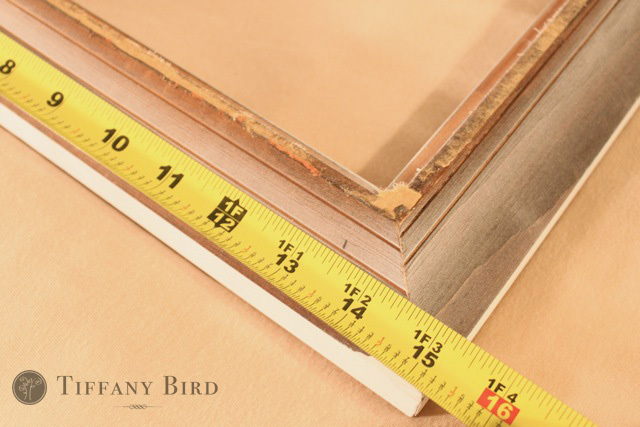 Take out the glass, backing, artwork and any matting that were in the frame. 2. 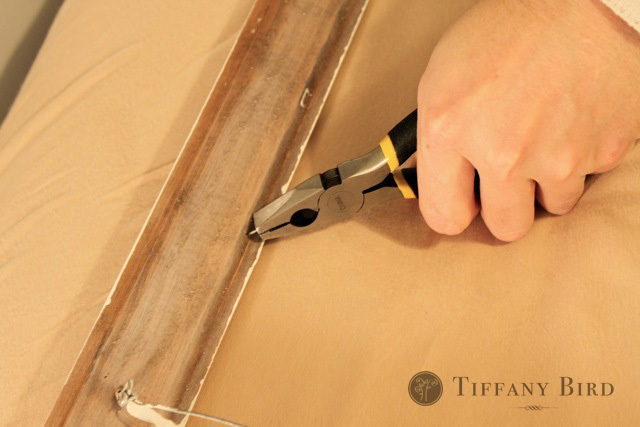 Wipe the wooden frames with a slightly dampened cloth or paper towel. Allow to dry completely. 3. 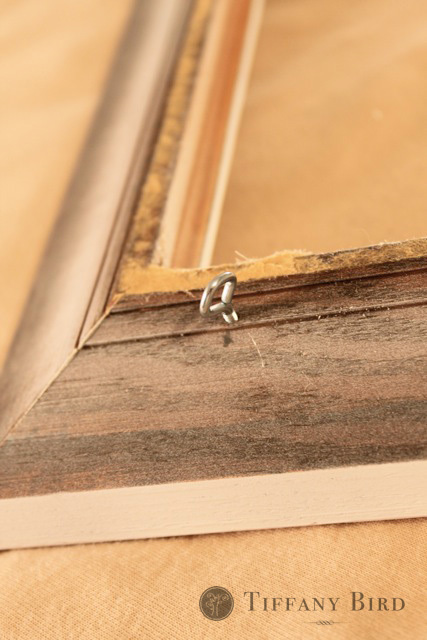 If the frames have a sealant on the wood, you will need to cover it with paint primer or sand it down to the original wood. And if you sand it, make sure you wipe off all the dust with a clean damped cloth or paper towel. Then let it dry completely. 4. Spray paint the frames. 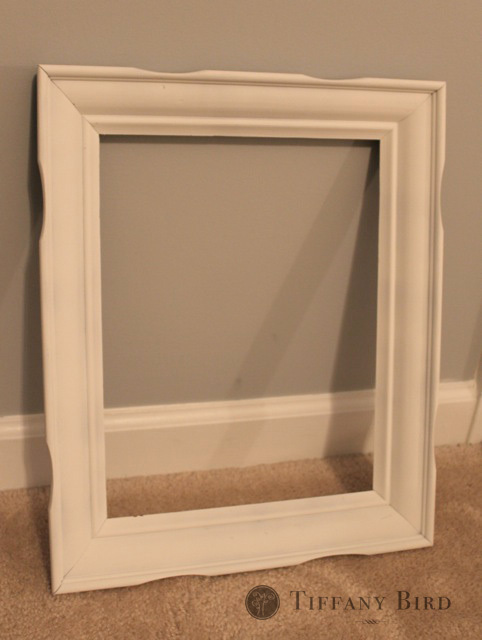 I used Krylon’s spray paint and it worked great getting the sides and creases of the frames. 5. 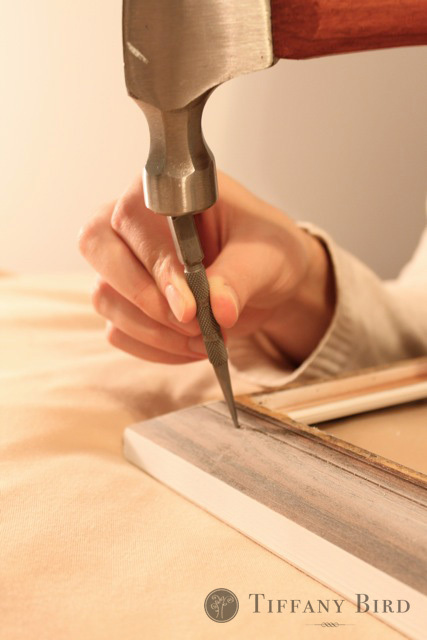 Remove any staples that held the glass and backing of the artwork using a flathead or pliers. 6. Measure and mark where you want the screw eyes to go. 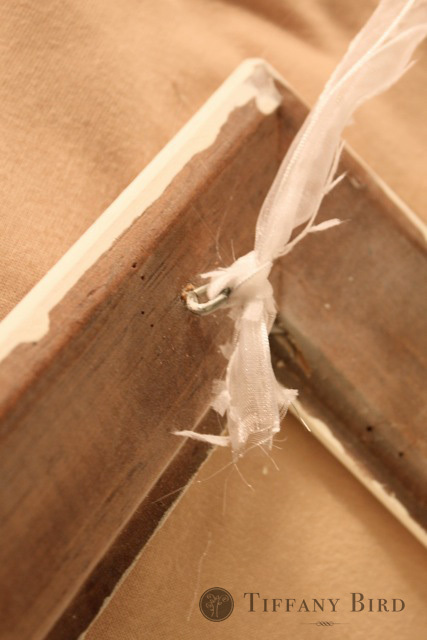 Since you will be tying ribbon to it, you will want it closer to the top corners that will hide the ribbons better. Do to both sides of the frame. 7. 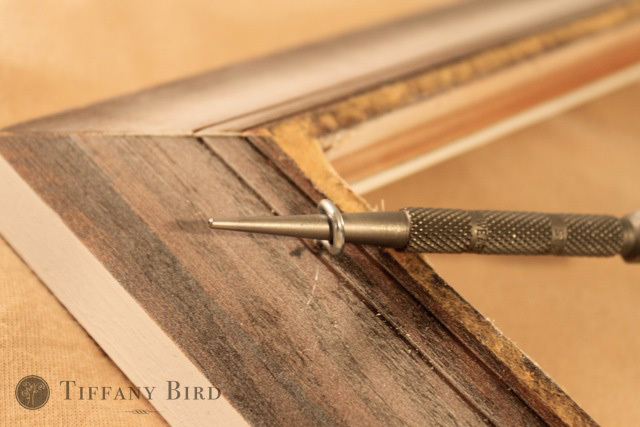 Use the awl and hammer to punch a small hole in the back of the frame. It doesn’t need to be very deep, but deep enough where it can hold the screw eye while you screw it in the frame. Do to both sides of the frame. 8. Screw the screw eyes into the holes. Do to both sides. 9. 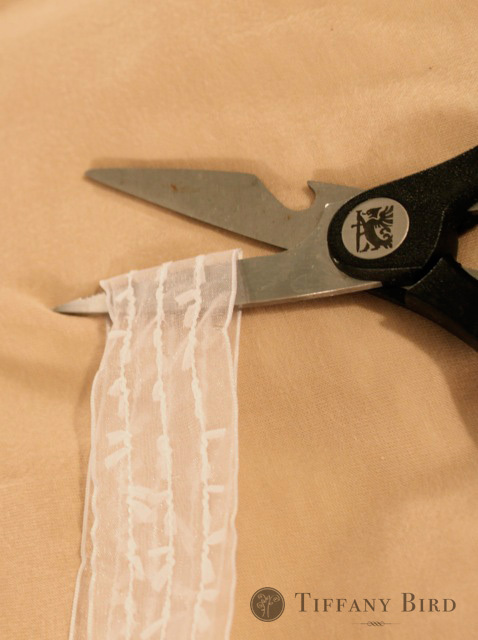 Cut and tie ribbons through the screw eye holes. Do to both sides. Finished! 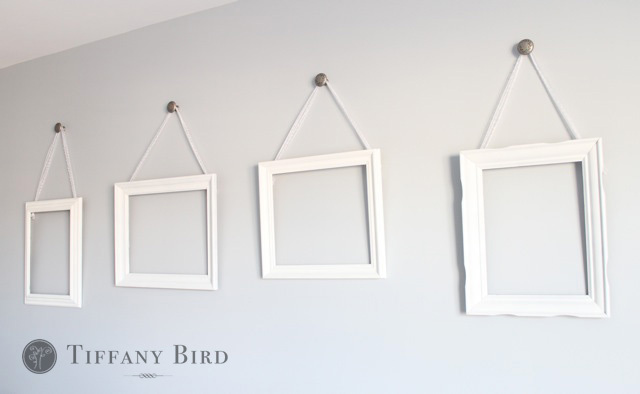 And with the finished product, you can put artwork in them, or put vinyl lettering on the walls within the frames or hang other items or decor within the frames. The ideas are endless. What would you do? Put the vinyl on the glass and then glue (hot glue) the glass to the frame. 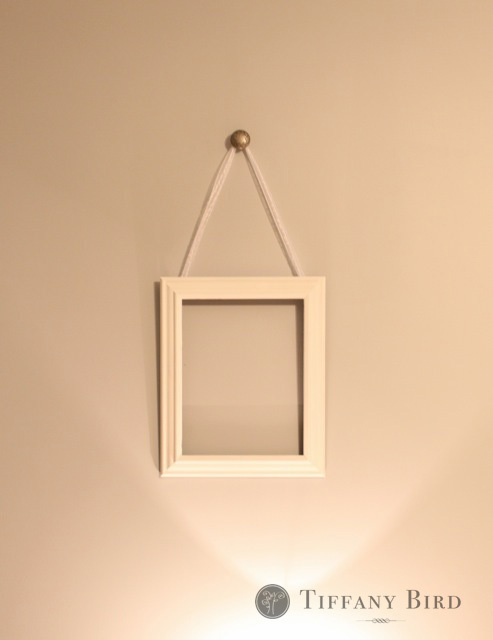 I would turn the frame over and put 2 more hooks in on each side of the frame and run a piece of wire from hook to hook. With a tiny white painted wooden peg i would peg a sepia photo of a tree, each frame a different tree. I L.O.V.E. your room. I love the simplicity of this, better than a head board. Great job and thanks for sharing. Your bedroom makeover posts have been so inspiring! With all of the holiday decorations long gone and the house clean, I’m ready for some new decor around the house. Thank you for sharing all of your ideas. Your bedroom looks fabulous, and I’m keeping my eyes open for some thrift-store frames. Thanks again! thanks for the tutorial on the knobs, love the idea…. also love the frames on the wall. Please don’t write me off as a critic, but in your picture of the awl and hammer you are actually using a nail set. If you use an awl, which has a much sharper point you will make a very small hole, which is exactly what you want, but the nail set has a dull end that sits on the head of a nail, that you use a hammer to tap the nail deep in the wood, so that it is kinda below the surface of the wood. Using an awl is a great idea, I have tapped a nail into the wood and then used that hole to turn the screw eye… you really must do something, cause screw eyes are made of much softer metal and I have had them twist off in my hand trying to put them into wood. 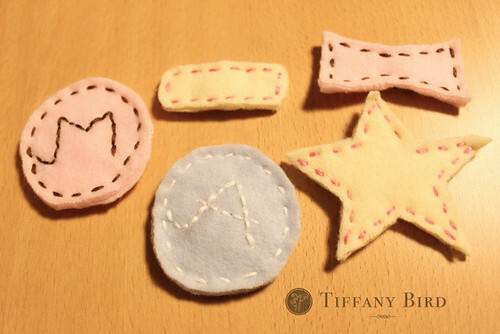 Love your blog and tutorials – thanks for sharing.